In the heart of Champagne, the Pavillon du Lac**** is part of the Chateau de Juvigny, historical monument of the XVII century. Surrounded by a moat, it looks over a 5 ha lake on one side; over a 14 ha park on the other. Completely restored in 2013, it offers comfort and calm in an exceptional environment. This lodge of 49 m² includes: a living / dining room; a fully equipped kitchen (hob, oven, dishwasher, washing machine and robot); a bedroom of 12 m² with desk; a shower and separate toilet. Electric heater, TV, Internet, Linen provided. Small garden to the East, terrace to the South, both overlooking the moat (see blueprint). Closed parking. Possibility of strolling and resting in the park, of swimming and fishing in the lake. Small grocery store / catering and barber at 7 mn walk away. The chateau de Juvigny, built in 1702, has been in the family since the French Revolution. We are dedicated to maintaining and renovating it. We are pleased that our hosts enjoy it. This project allowed us to restore the 18th century pavilion. We are pleased to share this historical patrimony with the people who choose to stay here. Vacationing in a historical environment, amidst a lake, a park and woods. A peaceful and relaxing place in Champagne beautiful countryside. A excellent location for visiting the Champagne region which offers cultural sites (Reims, Troyes, Verdun) and strolls through the vineyards. Easy cycling along canals or for the more adventurous through the vineyards. Small grocery store a 300 meters walk away. 4.9 m², a south facing window. Shower, large wash basin, heated towel rack-blowing. Delightful apartment in a chateau with all the comforts. The property was beautiful with a lovely lake and gardens. All the nice extras....fresh flowers and east and west facing terrasses to make our stay really special.The owners were knowlegeable about the history of the chateau and the area. Great weekend getaway with very comfortable private accommodation and friendly hosts. Lovely countryside to explore and Champagne trail a must. This apartment is outstanding and we do not hesitate to recommend it. 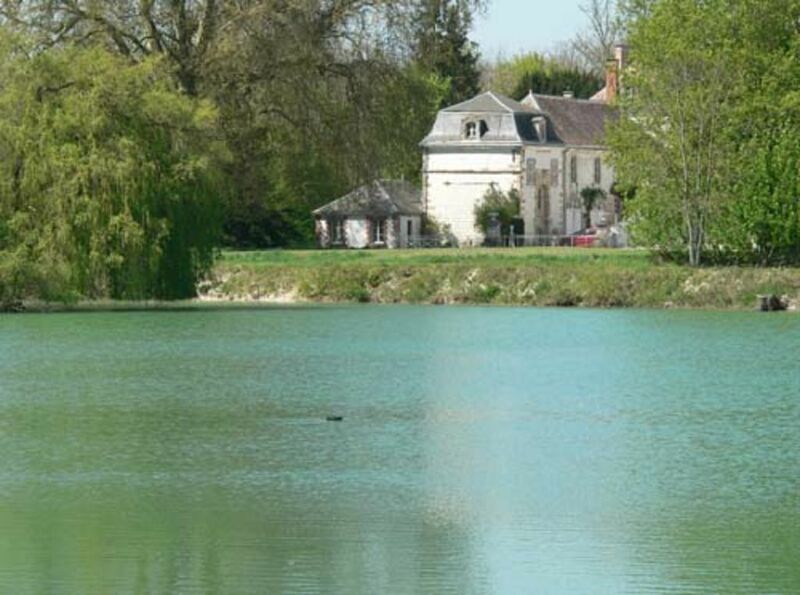 The old chateau with interesting history is special enough, the setting lovely with its own moat and family of 11 ducks (in 2018 there are 9 ducklings), lake, forests, flowers and tree lined avenue. The apartment is very pretty, spacious, nicely decorated, modern and everything you need, and more, has been thought of - the large vases of fresh flowers throughout was a lovely touch. It is blissfully quiet, no traffic noise at all and yet it is quick and easy to get on to the roads to all the main highlights of Champagne. Congratulations to the hosts, M. and Mme. Fournis, for their thoughtfulness in providing such wonderful accommodation and many interesting conversations. We loved it so much we didn't want to leave. My wife and I have just returned from a lovely restfull week's holiday in Juvigny - Marc (the property owner) was waiting for us on arrival and his welcome was very informative and useful. The Pavilion du Lac was beautifully presented with vases of fresh flowers throughout. It was an ideal location to view the Champagne area, we visited Epernay, Troyes, Chalons en Champagne and finished out week with a visit to the magnificent Reims cathedral. Altogether a very enjoyable weeks holiday and we would thoroughly recommend this property. We had a very relaxing, peaceful stay. Our hosts were very friendly and helpful. The accommodation was clean, recently renovated and warm. Our stay was December, cold and wet outside but toasty warm inside. Due our visit being over the new year nearly all the champagne houses were closed but for us it did want we wanted for this trip. I’d love to revisit in the spring or summer when it will be buzzing with all the activities in the lake and park right in the door step. Because of the bad weather Terry and his wife did not have the opportunity to enjoy the park. To enjoy it, it is preferable to come from April to early November. We were very pleased to welcome Terry and his wife who are charming people. High end, very 'French', extremely peaceful and welcoming. Located in the heart of Champagne. A 10 km from the vineyard, 10 km from Chalons en Champagne, Epernay 25 km, 35 km from Reims, 90 km from Troyes. Access via the A4 / E50 (exit 27) and Hwy 26 / E17 (exit 17) motorway. Prices include house linen and cleaning service at the end of the stay. Beyond two people an extra € 8.00 per night will be requested. Only in Low season, electricity consumption will be billed in addition. "Visitor taxe" = 1.20 euro per night and per person above 18 years old. Version française Le prix de la location comprend le linge de maison et le nettoyage en fin de séjour. Au-delà de deux personnes un supplément de 10,00 € par nuit sera demandé. En Basse saison la consommation d'électricité sera facturée en sus.